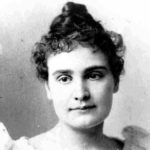 Johanna Mansfield Sullivan Macy better known as Anne Sullivan, was an American teacher, best known for being the instructor and lifelong companion of Helen Keller. At the age of five, she contracted trachoma, a highly contagious eye disease, which left her blind and without reading or writing skills. She received her education as a student of the Perkins School for the Blind where upon graduation she became a teacher to Keller when she was 20. "My heart is singing for joy this morning! A miracle has happened! The light of understanding has shone upon my little pupil’s mind, and behold, all things are changed!"